The High Road Less Traveled | brainsnorts inc. 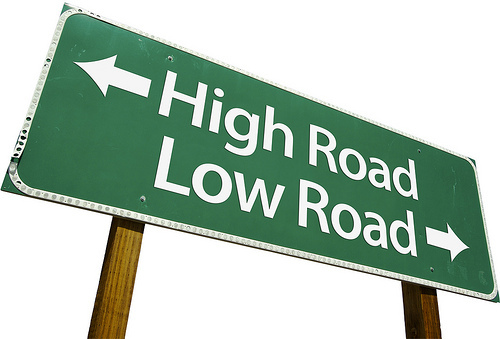 The high road is important, but it is not fun. It is delayed gratification, or no gratification. On the high road, it is not what you gain. It is what you do not lose. What’s this about? My stalker is back. If you would like details, you can read this post from The Rise and Fall of Me, which spells out all of the specifics. But to summarize, he is a drug-using, wife-abusing, disability-using phony who has quite successfully figured out how to avoid being a responsible human. He has, in the past, attempted to leave disparaging comments and statements about me here and other places. He has also attempted, possibly successfully, to contact some of you individually to spread similar comments. He claims that I am lying in my posts about myself and believes he has knowledge about me that I have either hidden or misrepresented to you. It is very clear that I have revealed all there is to reveal and shared all that is relevant to share. All he has to add are lies and exaggerations or distortions. I apologize if he has bothered you. I apologize if he has cast any doubt on anything you have read. If he has contacted you and caused you to have any questions or concerns, I invite you to either ask anything you wish here or email me privately. I will answer anything you want to know. Getting back on the high road, or the low road, that would involve things like posting his name, address, phone number, and other personal information here – but I’m above that. It is my belief and practice to not provoke an idiot because you just never know how far they will go. I mean, he already traveled roughly three hours to put a Slinky in my mailbox and, on another occasion, burn holes in my deck furniture, so there’s no telling what else he might do. People like him usually have very little self worth, so they are willing to take dangerous chances because they don’t perceive there to be very much for them to lose. I will just take the high road and hope he forgets about me for another year or so. Maybe he will find something useful to do, but I doubt it. Thanks for listening. Reading. Whatever. no reasoning with a person like that. Stay safe. Teh high road also gives you the satisfaction of being a decent person. thanks. i do feel decent. not usually, but this time at least. I can relate. It’s a tough ride. i’m sorry you can relate, but i’ll gladly join you on any ride. thanks. I like to think of it as a ride because rides eventually come to an end. Just have to buckle up. I’m sorry, but a slinky? That’s kinda funny. Weird, but funny. i had written something about a slinky, a comment on another site, and he had left a comment after me. then the slinky was in my mailbox. creepy guy. At least you have the comfort of knowing that you are a far better person than he could ever hope to be. I hope the impact of his actions is not too detrimental to your life. What a loser. thanks very much. the comfort is a good thing to have, and i’m sure you have it too. A slinky, a slinky, for fun it’s a wonderful toy, a slinky, as slinky, for creeps it’s a wonderful ploy! If I try to think about the amount of times I say to myself “whatdafuck” in my mind when I read your real life posts, I’d be needing a better calculator. He’s reading this right now? Hold on, I’m going to run and lock the doors. Eek, they don’t lock! ohmygodohmugodohmugod – what have I done? ps. Make sure the daughter knows about the creepster.